Faced with such a problem: when I connect any external removable USB HDD or flash drive, Windows doesn’t assign a drive letter to it. When a drive is connected, a message appears indicating that a new device is installed, the drive appears in the Device Manager, but is not displayed in the File Explorer. To make the drive available in the system, you must assign a drive letter through the Disk Management console each time manually. To do this, open the Computer Management console (via the Win + X menu) and go to the Storage section -> Disk management. In the list of drives, locate the connected removable USB drive. As you can see, the disk is online, it has one healthy partition with the NTFS, but it is not assigned with a drive letter. 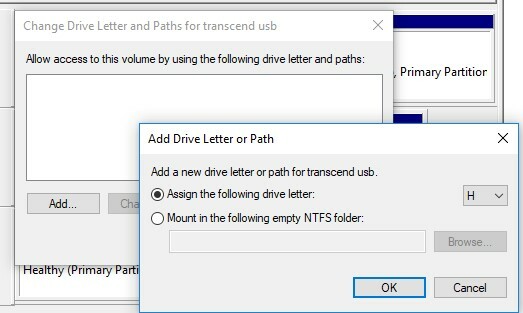 To assign a drive letter to it, right-click on the partition and select “Change Drive Letter and Path“. In the window that appears, click the “Add” button, select “Assign the following drive letter” and select the letter you want to assign to the drive (for example, H: ) in the drop-down list and click OK.
After that, the connected USB drive appears in the File Explorer with the assigned drive letter. However, after disconnecting the USB device or restarting the computer, the drive letter won’t be assigned automatically to it. I have to assign the letter again manually through Disk Management, and that becomes annoying. Tip. 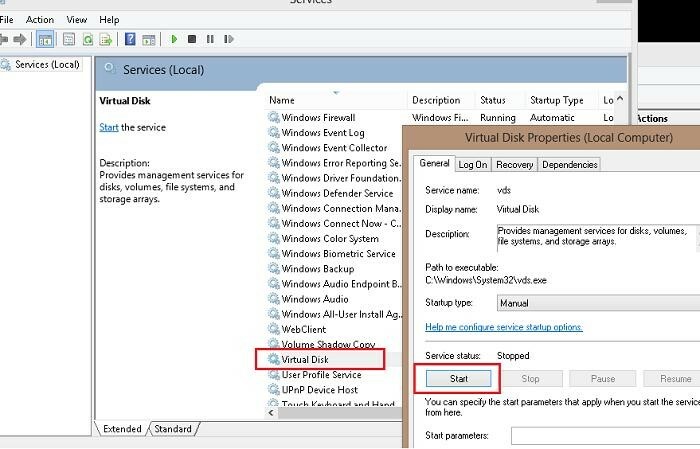 Make sure that Windows recognizes the partition (s) on the connected USB drive and the partition is formatted with the NTFS, FAT32 or exFAT file system. If the file system is detected as RAW, or the disk is unallocated, most likely the USB flash drive is just a new one or the partition table is damaged and you have to repair the file system at first. It seems that some feature of automatic detection of partitions on the external hard disks fails. How to solve this problem? First of all, make sure that the Virtual Disk service is running. You can check the status of this service in the services management console (services.msc). Check if the problem persists. If it does, make sure that the automatic mounting of new volumes is enabled. Note. When the automount is enabled, Windows automatically mounts file systems of new disks connected to the system and assigns drive letters to the partitions. If the automount is disabled, Windows detects new disks, but doesn’t automatically mount them or assign any letters to the new volumes. Restart your computer and verify if the letters are assigned to the external USB drives. After that, this partition on the USB flash drive should automatically be assigned a drive letter on any computer. Also keep in mind that if there are several partitions on the USB flash drive, then Windows will only see the first partition. 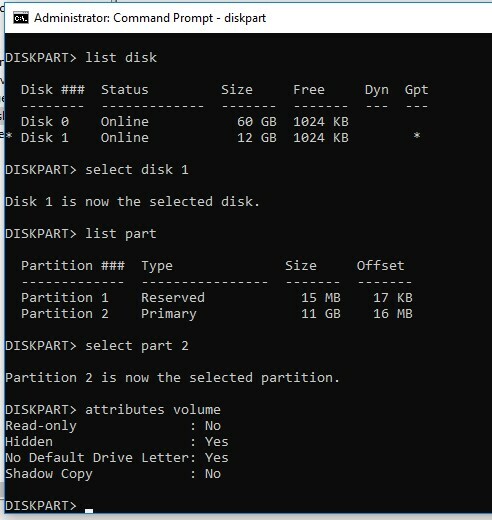 The ability to create multiple partitions on removable USB drives appeared only in Windows 10 1703. 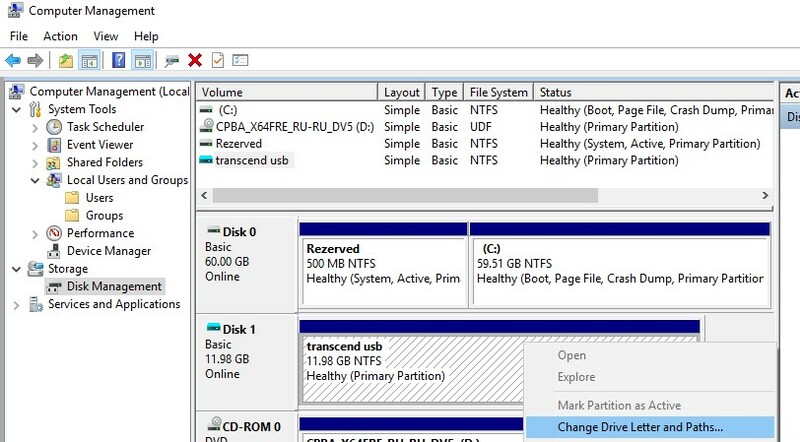 Previously, in order to make second and subsequent partitions on the USB flash drive were accessible in Windows, you had to use a trick to make Windows recognize USB flash drive as a HDD). If your USB flash drive doesn’t appear in the Disk Management console, try using a different USB port, cable. Try to connect the USB flash drive directly to the computer (without the USB hub), check whether the power is on, and whether it is recognized on other computers. Finnally something that worked. 4 of my 9 USB keys no longer mount on my computer but worked on my wife’s so I knew it was a Windows problem. Gave up a year ago trying to solve the problem because none of the solutions on the web worked – and there are tons of them. So after loading Win 10 thought I would see if my keys worked they still didn’t so I did a google and this solution pooped up. This fix worked like charm. Thanks for posting friend. Great help! Thank a lot! You rock!!!! Been fighting this on a SBS 2011 server. Enabling automount did the trick. Well done – automount worked like a dream in Windows10 Anniversary edition (on my laptop). Many thanks. Good Job. Thank you verry much. I had exact problem and this solution helped me.